From left: Vocational Service Award master of ceremonies Paul Treece, award winner Amy Huddleston and Rotary president Chuck Peterson. 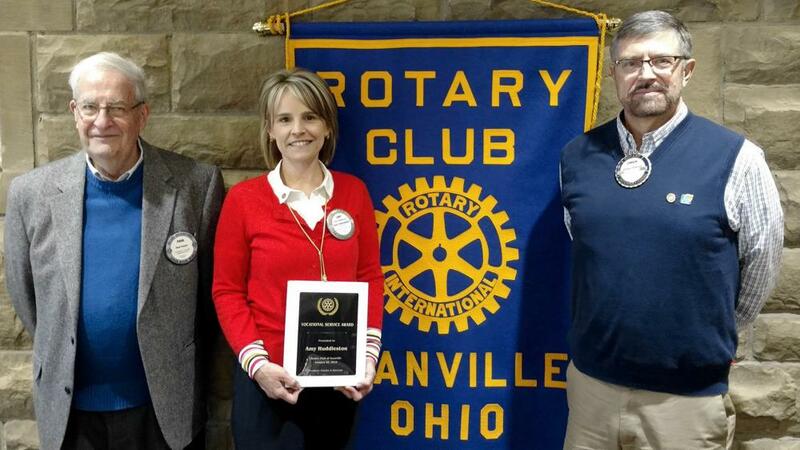 Her business serves seniors and her volunteer work is aimed at youth — both of which were factors in Amy Huddleston becoming the 25th winner of the Granville Rotary Club’s annual Vocational Service Award. The award was presented at the club’s Jan. 28 meeting and was first presented in 1993 to the late Howard LeFevre, said master of ceremonies Paul Treece. The award is given to those who practice high ethical standards in the workplace and exhibit a “very high caliber of professionalism, enthusiasm, work ethic, commitment to service and vocational excellence,” Treece said. Huddleston, a past Rotary president, was praised for her leadership in the Home Instead Senior Care franchise she opened in Granville in 2004 as its only employee. But Sue Cherney emphasized that Huddleston’s commitment to seniors goes beyond her occupation. “Through her vocational commitment to serving seniors with high quality care at her business to her volunteer involvement as president of the board of directors of the Granville Senior Center, she’s utilized her skills to enhance the lives of seniors in the Granville area,” Cherney said. Rotarian Tony Skufca, a volunteer caregiver at Home Instead for more than 10 years, remarked how Huddleston had fewer than 10 volunteers when he started. “The last number I saw was slightly under 200. It may be higher than that now,” he said. Cherney also noted Huddleston’s involvement with youth endeavors, including the coordination of Rotary’s annual Leadership and Ethics Conference held each fall for 10th- and 11th-graders from 10 area high schools. The conference, with a variety of speakers, emphasizes understanding ethics and the importance of being fair to all concerned when making decisions. Cherney added that Huddleston has served on the Licking County Foundation’s scholarship review committee helping to choose scholarship recipients. In addition to being Rotary president, she was the club’s Service director that oversaw a large number of Rotary projects, several more involving youth. Huddleston thanked her husband, Clay, for letting her pursue her career as she wanted to. Huddleston also credited the work ethic displayed by her parents, Joe and Julie Dudas of Gahanna, who were present for the presentation, as an inspiration.